Peterson's style is sprightly with flashes of wit, a pleasure to read. The German-speaking inhabitants of central Europe did not automatically think of themselves as "Germans"—not before 1871 and not always after unification. In fact, they spoke mutually incomprehensible dialects, owed allegiance to different leaders, worshiped in different churches, and would not have recognized each other’s customs. If asked about their identity, these prospective Germans might have answered Austrian, Bavarian, or Prussian, and they could as easily have used more local labels or resorted to occupational markers. For this disparate population to think of itself as "German," that word had to acquire content—people had to learn a whole set of stories they could tell themselves and to others in answer to the question of identity. History, Fiction, and Germany chronicles how German nationalism developed simultaneously with the historical novel and the field of history, both at universities and in middlebrow reading material. The book examines Germany’s emerging national narrative as nineteenth-century writers adapted it to their own visions and to changing circumstances. These writers found and popularized the nation’s heroes and heroines, demonized its villains and enemies, and projected the nation’s hopes and dreams for the future. Author Brent O. Peterson argues that it was the production and consumption of national history—the writing and reading of the nation—that filled Germany with Germans. Although the task of national narration was never complete and never produced a single, universally accepted version of German national identity, tales from Germans’ gradually shared history did more to create Germany than any statesman, general, or philosopher. History, Fiction, and Germany provides a valuable resource for scholars and students of German studies, as well as anyone interested in history and the articulation of national identity. Brent O. Peterson is associate professor and chair of the German department at Lawrence University. He is author of Popular Narratives and Ethnic Identity: Literature and Community in Die Abendschule (Cornell University Press, 1991). History, Fiction, and Germany is a smart and compelling book about a largely forgotten literature: nineteenth-century historical fiction. In his careful readings of these once highly popular novels, Peterson opens a new window onto the real dilemmas of Germans attempting to understand their nation's past and present." Brent Peterson's meticulously researched book draws on an astonishing range of source material. These include historians-both famous and forgotten-and novelists, ranging from familiar figures to the utterly obscure. Yet Peterson's book does far more than this historical spadework. His remarkable achievement reconstructs the collective myth of German history that gradually took shape in the work of countless nineteenth century writers and created a sense of common identity among its readers. Peterson's book is further distinguished by its conceptual clarity, stylistic elegance, and a sense of humor that surfaces at unexpected moments. In short, History, Fiction, and Germany is an important contribution to German Studies that sheds new light on the construction of German national identity in the century of its first unification." 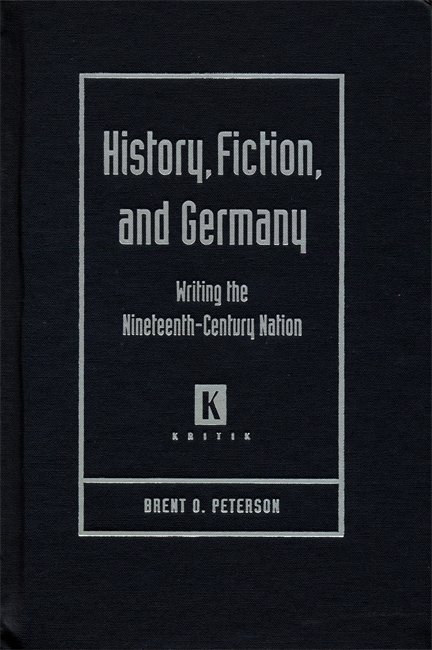 Brent Peterson offers in History, Fiction, and Germany: Writing the Nineteenth-Century Nation a refreshingly new, intelligently argued, and well-calibrated examination of the invention, negation, and reshaping of a common past for the sake of nation in nineteenth-century Germany. His sharp focus on a startlingly original selection of historical novels, works of German academic historiography, and popular histories that treat central myths, personalities and events of the yields a nuanced and convincing picture of evolving and contested ideas of national community. Written in an engaging style and dry humor, this study demonstrates the elasticity of historical truth and the power of historical narrative in service of a political agenda." Peterson's style is sprightly with flashes of wit, a pleasure to read." Historians will be familiar with the central themes in this book, but they will find many of Peterson's examples and much of his analysis interesting and new." This is an engagingly written study – Peterson writes with a dry wit, and this makes the book a joy to read ¬– and it is a must for scholars of the nineteenth-century German literature, as well as historians interested in the foundational politics of their profession. Literary scholars will encounter not only a wealth of forgotten historical novels (rightly so, Peterson argues), but benefit from his side-by-side comparison of literature and academic history. The book easily convinces the reader of the importance of historical fiction for the shaping of German identity." This is an important and well-written study. One of its great strengths is that Peterson does not aim to trace the development of a nationalist programme in popular novels. Instead he analyses an impressive range of popular and lesser-known contributions to the discourse to show the great variety of versions of German identity coexisting simultaneously."